I’ve been thinking about starting a little something here on the blog called “Tips and Tricks”. I’m so often sewing and quilting and think of a step I’m doing that I want to share with you all. I know that some of you are smarty pants out there and will know everything I have to share and more…so please! add to the conversation with more of your own suggestions! 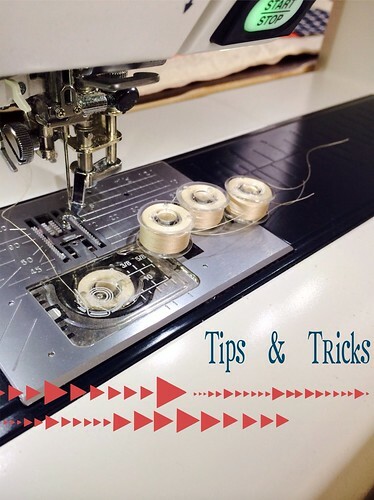 Each tip is something is something that I’ve discovered, learned or seen over my many years sewing. Starting to quilt a new project? Try prewinding multiple bobbins in advance to avoid stopping in the middle of your project to rethread, wind and reload each time! It may take some time to estimate how many bobbins you will need for a particular project but I think having three ready is a good number to start with. Keep in mind that free motion quilting often eats up thread faster than straight line quilting. Nothing is more frustrating than losing your momentum in the middle of a good quilting run! Great idea, and I think you are right that we absorb better by seeing tips one at a time. A list of 20 is great but I'm only going to remember 3 tomorrow! Pre-winding bobbins is really useful when you are quilting. Also, I think you should share your tips even when you think we might know them, some folks might not and never will if we keep it a secret. So share away I say. Nice new series. So true….I find that we can all learn something from other people for we all have our little ways of doing things and some are the most simplest that you may never of thought of. I've started buying my quilting threads two at a time. That way, I can wind a whole one onto bobbins and use the other as my top thread. I mostly do this with white, cream, and black– colors I use all the time. I store them in a bobbin box and label the whole row with the details of the thread. Prewinding really does make everything easier. I hate losing my momentum in the middle of the project to wind a new bobbin. yes! that is a great idea if you have two of the same color and perfect for the neutrals you use all the time. I even do that if mine are close to the same color! Speaking of bobbins I could never remember what brand and color of thread was on my bobbins. Now I have corrected that by keeping a fine tip permanent marker at my machine and when I wind bobbins I mark on the bobbin the brand of thread and the color # or name. When the bobbins are empty all it takes is a dab of Isophropal alcohol on a cotton swab to clean off the marking so I can start over. Makes my life ever so much simpler. ooh- Dawn! I just saw your comment after reading Suzanne's! we could use those little cosmetic sample bottles to store a little alcohol in our sewing supplies! I always pre-wind, but not because I was smart enough to do so on my own, because I got the idea from another quilter! We do learn from each other! Great idea!! But I take it a step further. I buy two spools of thread. I use one of the spools for nothing but bobbin fill and fill all the bobbins at once. That way I know at a glance how much thread I have left on any particular project. Just a thought. Great tip too!! Thank you for adding to the conversation. We are all learning so much from each other already! Great idea for a series. Its so frustrating to wind the bobbin in the middle sewing and ripping and doing again to avoid the backstiches being seen or the gathering ending half way.